Since Apple launched its mobile wallet capabilities alongside the iPhone 6 last year, the mobile wallet has served as a battleground between banks, tech companies such as Google and Samsung and retailers, with each trying to gain and retain customer loyalty. The ability to provide a great user experience is why technology providers have superseded bank offerings that usually focus entirely on the payment functionality. Early indications are that consumers will adopt technology only if it provides value by being seamless, easy to use and contextual. Moving from physical to mobile wallets brings challenges when fighting to be on the ‘front screen,’ since customers can attach new cards with just a few simple clicks. The key will be to avoid losing control of customers, finding innovative ways to provide customer value by combining payments, loyalty and contextual insight to make personalized offers and gaining ’ top of mobile wallet’ positioning. If done well, the relationship between the bank’s brand and the consumer will be strengthened and loyalty will be earned. 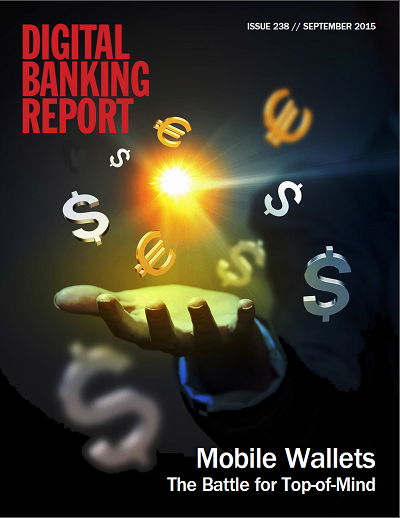 The intention of this report is to provide a snapshot of the highly volatile mobile wallet marketplace. It is hoped this will provide a strategic foundation for responding to the changes as they occur, and allow firms to compete effectively in the future. Beyond looking ahead, our market survey includes an opportunity to review last year’s projections to determine which ended up being the most impactful. We also collected insight into the strategic priorities and fintech players that are believed to have the biggest impact in the future.